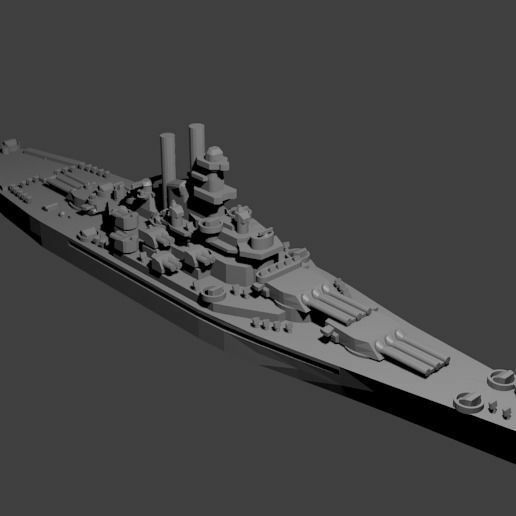 1/1800th scale New York Class Battleship model. Certain elements not to scale. The New York class was a pair of battleships built for the US Navy on the eve of the first world war. They saw extensive service during both world wars and the USS Texas was preserved as a museum ship. This model is based on the class's late-war appearance after extensive modifications to improve the anti-aircraft capability of the ship. As designed, they had ten fourteen-inch guns and twenty-one five-inch guns, but many of the five-inch guns were removed before WWII.